Congratulations to Jim Lehrer (r), winner of this year's Fourth Estate Award presented by Mark Hamrick at the National Press Club on Oct. 28. Legendary newsman Jim Lehrer of PBS' NewsHour, careening between tears of laughter and gratitude, accepted the National Press Club's most prestigious award Friday night, Oct. 28, with praise for his co-anchor of 38 years and the PBS staff. "It takes 18 people just to get me to say 'Good evening' and another 18 more to keep me from making a fool of myself," Lehrer said as he accepted the Fourth Estate Award at the gala dinner in his honor. The National Press Club honored Lehrer for his work on the NewsHour and his role as the most renowned moderator of 11 presidential debates in six elections. 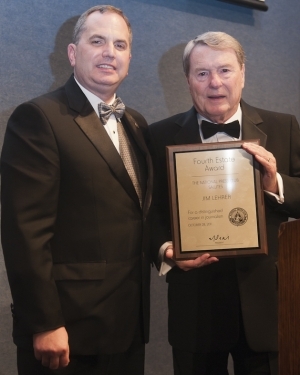 "Jim Lehrer embodies the best, timeless ideals of journalism," National Press Club President Mark Hamrick said. "He is a remarkable example how one can be both at once selfless and supremely successful and universally admired. With a body of work stretching from the Watergate era to the present, we couldn't be happier to have the opportunity to celebrate Jim's tremendous achievements." Panelists Robert MacNeil, Lehrer's longtime NewsHour co-anchor, New York Times columnist David Brooks, syndicated columnist Mark Shields and NewsHour executive producer Linda Winslow celebrated those achievements in a hilarious evening in which their longtime colleague and friend was roasted and toasted. His roasters poked fun at Lehrer's propensity for emotion, the elderly viewers of the NewsHour and its occasionally dry topics. "Jim is a man of enormous courage," Shields said. "He's the only one brave enough to devote nine minutes to currency reform in Kazakhstan." Their tributes to Lehrer praised his loyalty, compassion, humility and dedication to his family as well as his extraordinary journalism skills and commitment to unbiased, straight-forward reporting. "Most journalists ask long questions in which they only serve to show how much they know," Brooks said to a room of laughing journalists. "Jim's different. His questions take the form of questions. They're short. And after, something unusual happens. Sounds come into his ear, and are processed." Winslow, who called Lehrer a demanding colleague who occasionally frightened the interns, described his renowned listening skills as a two-edged sword. "Jim is one of the few men I know who always hears women when they speak up in meetings," Winslow said. "Of course, he's a professional listener. So don't say anything you wouldn't want repeated back to you exactly." MacNeil, his co-anchor for 38 years, said their professional relationship deepened into a devoted friendship. "When you have Jim's attention, you feel nothing is more important to him in that moment than you," MacNeil said. Over the course of their careers, MacNeil added, "I knew without a doubt that Jim would never do anything to further his career that would jeopardize my own." Lehrer couldn't resist poking back at his friends and colleagues, and the television news show that started as "The Robert MacNeil Report." "It was the worst title in the history of television," Lehrer said. "Can you imagine anything worse? My mother said it should be called the MacNeil Lehrer Report and six months later, it was." In accepting his award, Lehrer became emotional while talking about MacNeil's guidance early in his career and the staff on the NewsHour. "If they give you an award you think you don't deserve, take it, smile, and say thank you," he said as the crowd rose to its feet in the second standing ovation of the night. "So, thank you." Lehrer will be the honorary chairman of the  HYPERLINK "http://press.org/events/national-press-club-34th-annual-book-fair-authors-night" Club’s 34th annual Book Fair & Authors' Night on Tuesday, Nov. 15. His latest book, "Tension City: Inside the Presidential Debates, from Kennedy-Nixon to Obama-McCain" is on bookshelves now. The event was a fundraiser for the National Press Club’s  HYPERLINK "http://press.org/library" Eric Friedheim National Journalism Library, which provides training for news professionals, research for journalists and other media professionals, and journalism scholarships.